24 x 25 cm p. : chiefly col. ill.
Alex has two homes - a home where Daddy lives and a home where Mummy lives. Alex has two front doors, two bedrooms and two very different favourite chairs. He has a toothbrush at Mummy's and a toothbrush at Daddy's. But whether Alex is with Mummy or Daddy, one thing stays the same: Alex is loved by them both - always. 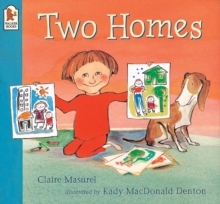 This portrayal of the life of a child whose parents are divorced is full of warmth, comfort and affection.